Our story could be said to begin with the pioneering development of systemic coaching and constellations in organisations by Dr Gunthard Weber in Germany in the late 1990s. However, it really begins with the first training in this method in the UK, which was run by Judith Hemming with the support of Ty Francis in 2000. This training later became known as the Community of Learning, Practice and Innovation (COLPI) in systemic coaching and organisational constellations. 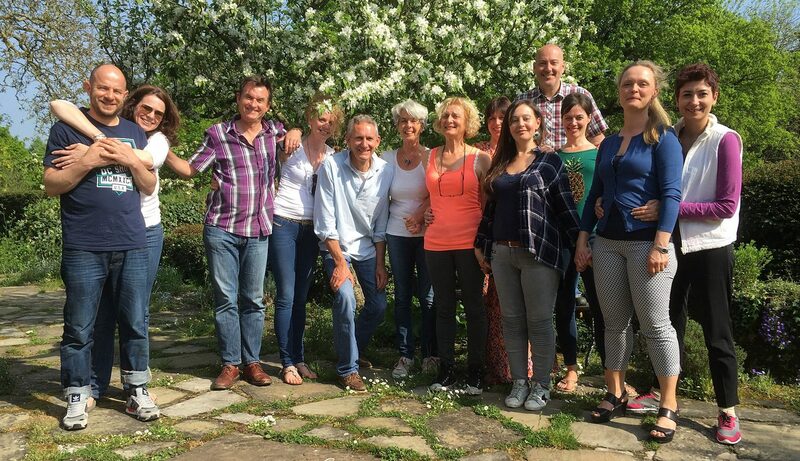 A year or so later, from 2001 onwards, the first trainings in intimate systems work in the UK were also being run by the Hellinger Institute of Britain – by Judith Hemming, Richard Wallstein and other leading Gestalt practitioners – with the direct support of Bert Hellinger (who pioneered the family constellations method). Our Founder Ed Rowland attended his first business constellations workshop in 2001, and was so fascinated and excited by what he saw – and the potential for his work in leadership development and executive coaching – that he immersed himself in training in both the organisational and intimate systems work for the next 4 years, before beginning to run his own workshops and trainings in 2005. This was part of the ‘nowhere’ era (c. 2004-2010) for systemic work in the UK, when both the organisational (COLPI) and family trainings were generously supported by the nowhere foundation (part of nowhere group, the innovation specialists). Ed partnered with the nowhere foundation from 2006 to innovate and bring forward a first new set of trainings specifically focused on Systemic Coaching and Constellations in a one-to-one context, which were delivered both as open programmes and bespoke in-house trainings in a corporate context. Ed also co-created a Systemic coaching and consulting service with Terry Ingham and Judith Hemming (the Directors of nowhere foundation). From 2006-10 Ed pioneered using the systemic method with clients in the UK and Europe including: de Agostini s.P.a, Roche, Encyclopedia Britannica, Lexis Nexis, the Royal Navy, the Leadership Centre for Local Government, Bath University and Henley Business School. Ed was also supported in this work by Mark Stanley and Alison Wooding (Head of Media for nowhere). In late 2010, Ed was inspired to form a new business dedicated to offering open trainings in Systemic Coaching and organisational constellations as well as purpose-led systems consultancy, team and executive coaching work. After an incubation period to find the purpose and shape of the new business, Ed founded The Whole Partnership – along with Mark Stanley and Alison Wooding – in 2011. Consultancy clients in this early period included the Financial Services Authority (FSA), Maxxim Consulting, Scottish Police and Falkland Estates Trust. Also in 2010-11, Judith Hemming and Richard Wallstein passed the management of the family trainings on to the next generation of leading British practitioners – including Ed and Gaye Donaldson – and they formed the Centre for Systemic Constellations (UK) Ltd as a separate non-profit institute to promote systemic (intimate) training and research. In 2012, The Whole Partnership was formed as a limited liability partnership (LLP), and others joined the team. An expanded area of focus was work with boards and senior leadership teams – using our unique approach to systemic team coaching – and new consultancy clients included VISA, the States of Guernsey, Volunteer Scotland and Sct. Ols (a Danish family business). In 2014, Judith Hemming passed on the baton of COLPI, so that our longer Practitioner programme could be offered under the COLPI name for the first time (in collaboration with the Centre for Systemic Constellations UK). This also enabled dual certification by a systemic training body, in addition to its certification by the International Coach Federation (ICF). As part of our emphasis on innovation, in 2014-15 we also delivered a first open Purpose Programme (a leadership programme in two three-day modules), which uses our generative “whole self, whole systems” approach. Ed co-created this work with Sarah Rozenthuler, a leading dialogue and leadership specialist, and author of “Life-Changing Conversations”, who joined the TWP team in 2014. Our consulting and team coaching work – in which we weave systemic principles into the facilitation of powerful, creative meeting spaces – also led us to develop the concept and practice of ‘Systemic Dialogue’, which we have shared and launched as a two-day open programme in 2016. New clients in this period have included Said Oxford Business School, Yahoo! Japan, Boston Consulting Group (BCG), KAUST, the Academy for Chief Executives (ACE), the Intellectual Property Office (IPO), Uffindell Group, and Morris Graham. We have also been invited to take our work to conferences for the Association for Coaching, Kozminski University (Warsaw), Systemic Leadership Summit and Purposeful Enterprise Summit, and extended our outreach by running affordable events in partnership with Psychologies magazine, Cortijo Romero (Spain) and Alternatives and St Ethelburga’s in London. We also support the development of communities of practice by our ex-students.